After working over 7 years in the Business License Department, Ismael Vargas has been appointed as the new Director of the Business License Department at the Town of Cicero. The appointment was made at the Town of Cicero board meeting held on Tuesday, March 13, 2018. Mr. Vargas was previously the Manager for the Intervention Program/Gang Specialist at Corazon Community Services and coordinated the All Stars Program in Unity Jr. High School through the Family Service and Mental Health Center. In 2011, Ismael Vargas began working in the Business License Department as an Inspector. Mr. Vargas saw the need in his community and began participating in many programs and events. 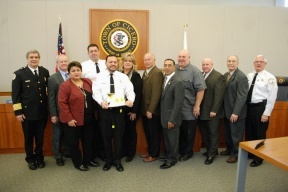 Then in 2013, Ismael Vargas was sworn in and appointed before Town President Larry Dominick and the Town Board of Trustees as the volunteer Town of Cicero Chaplain for the Police and Fire Department. Mr. Vargas currently serves voluntarily as the Chaplain for the Town of Cicero’s Police & Fire Department. He is also a coordinator for the Parent Patrol Program which started with 10 Parent Patrols and now has over 200 Parent Patrols voluntarily giving their time to keep children safe for District 99 and District 201. Mr. Ismael Vargas is also the coordinator for the Cicero Clergy Committee where he meets with various Clergy men and women of Cicero every month to talk about services and needs the community has as well as to work hand in hand with our government for the community. Mr. Vargas currently is the President of the Cicero Graffiti Committee. In 2013 he was elected to be a Library Trustee and is now the elected President of the Library Board of the Town of Cicero. He is also a board member of the Community Chest Foundation. In addition, Mr. Vargas also coordinates the Annual Mi Gracia Fest and Annual Cicero Prayer Day in our community. Overall, with the support of Town President Larry Dominick and the Board of Trustees Ismael continues to serve his community in many different capacities and hopes to continue to see the ongoing growth of the strong community he has proudly been a resident of for the past 20 years. With his new position as the Director of the Business License Department he hopes to continue to provide excellent and professional service for the businesses, organizations, and churches of the Town of Cicero.